Given my recent declaration about the business of art a fellow blogger Claire very kindly directed me towards this New York Times Article, titled "Tight Times Loosen Artists Creativity, and I thought, uh huh! Yep! Exactly! It is really nice to know I'm not alone. "Many artists echoed Ms. Holland, testifying that the recession had strengthened their commitment to their work or allowed them to concentrate on their art". It's funny but once I made the decision the creative floodgates opened. I did this about 7 /8 years prior to taking up art in 1995 at the age of 40. It's interesting to look at the differences before and after. This is done from a transfer and is very traditional, and pristine. I am discovering that my embroidery is not much different than my painting in that I like a little rough edge, not so precious and with some evidence of the drawing/materials beneath. I was inspired and wanted the challenge of doing a skeleton after seeing Angelo Filomeno's work, but I found in the process that as beautiful as the work is, it looks perfect technically. I LOVE it, but I seem to like that human imperfection, that raw quality. I used a fabric marking pen to draw the skeleton out on the reverse side of synthetic silk. I also want some of the drawing lines to show, and the satin stitch NOT be perfect. Because I had no reference for what type of stitching or stitching direction I just had to figure it out which in my mind helps reinforce the imperfections and fragility of life. I have a new blog link called MrXStitch and if you want to see something different then check out the most amazing examples of contemporary embroidery around. On our daily doggie walk I came across this and was delighted that someone took the time to leave a note and my cheap horrid but much loved sunglasses on a tree stump. Whoever you are, THANK YOU. It was a lovely reminder of why I love living in Yellow Springs & the simple kindnesses here that make it is so special. I wonder how many times people walk past this beautiful iron fence in Kings Yard and never notice it. The sun was making everything sparkle one day, the shadows danced across the path and I saw it for the first time, I mean really saw it. What a beautiful piece of ironwork. Funny how you can miss some things you didn't expect to. I miss these. They used to sit on my coffee table. One by one they got sold off or incorporated into other art pieces. 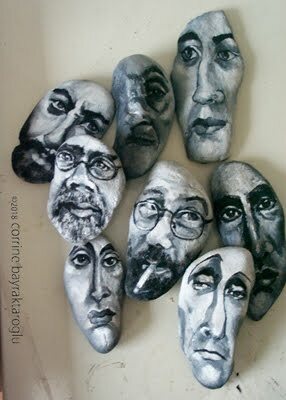 One of these days I will have to find some new stones and paint faces on them. Meanwhile another artist is getting a lot of attention for her faces on potatoes and what fun they are too. This one however wasn't planned, it just naturally looked like an unhappy potato sitting on my neighbours shelf above the cooker. I LOVE some of this potato art , the hedgehog is adorable. Anyone familiar with my blog or work will of course recognize my little spuggy. This isn't a big moan or a whine, it's about the process of change. I have been really blessed in as much as never having to fight for a show, or beg to be in a gallery.I have had two great episodes of projects in the national and international news (that was a lark), and people like my work and have supported it. For that I am truly thankful. 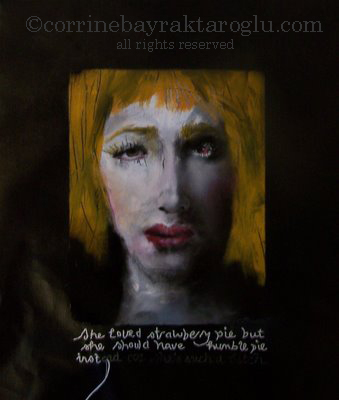 I have decided to give up the business of "being" an artist, trying to make a career as an artist, at least actively. Here is a great essay about the subject. I am not giving up doing art or showing it when the mood and circumstances strike. I just want to divorce the relationship from the professional aspect of being an artist. 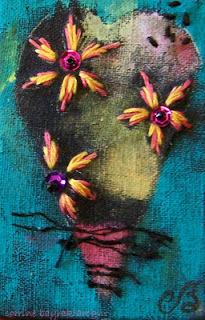 I made a 2"x3" painted and embroidered heart for the Miniature Show at IN A FRAME for June. I dyed some Linen black (I have a black finger to prove it-leaky glove) a few days ago and cut off a little piece for this project. I picked him up at a garage sale and he decided to stop by Nancy's for a drinky poo. This is what happens when you have a few too many. 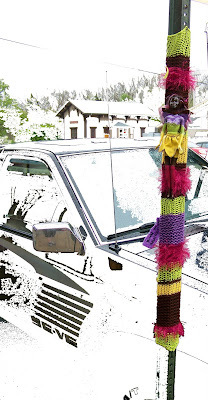 Of course, err, the jafagirls are going to decorate him. Other than that life is rather quiet at the moment and I'm liking it. People often ask what inspires an artist and I would have to say for me EVERYTHING, even a light show on Fremont Steet in Las Vegas. I love the colours and the abstract swirling patterns, the pounding music. Somehow all the experiences absorb into the unconscous and sneak out into my art one way or another. I decided to cut up an old painting and play with it. I've always liked this painting but didn't know what to do with it until now. Doing couching stitch on oil painted canvas isn't easy, but I like the effect. I also added white eyelashes on one eye. "Copyright, a form of intellectual property law, protects original works of authorship including literary, dramatic, musical, and artistic works, such as poetry, novels, movies, songs, computer software, and architecture. Copyright does not protect facts, ideas, systems, or methods of operation, although it may protect the way these things are expressed." I mention this because there is some confusion in the craft world in regards to copyright. I can understand why. Here is the conundrum: an embroidery pattern is copyrighted, HOWEVER here is the dodgy part (from Tabberone's) and why knowing about it is important. 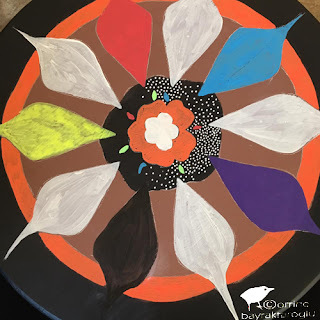 You can use a copyrighted pattern you have purchased to create your own work for personal use or for sale, but you cannot publish the pattern or make minor alterations and claim it as your own. I drew out a flower and did couching/satin stitch for the stem, cretan stitch for the leaves, french knots for the center of the flower, long and short for the petals. The bar at the bottom is a piece of reverse painted plastic I had done a few years ago and cut up. First time I've done Cretan stitch , and I would love to try some of these ones. It's a process that requires a computerized embroidery machine and has a really pristine perfect look. There is something beautiful and meditative in the process of hand sewing. As an artist the process is as important as the creative results, as is developing skills. I suppose if one wants to get into mass production like Takashi Murakami then a machine is an excellent idea. There is some amazing digitized embroidery out there. If one just has to download an image into the computer then anybody can do it, right! Unless of course they create their own designs or artwork, but are the stitches on the machine limited so that all the embroidery has a uniform look? I can't seem to find info on how many stitch options there are on machines ( I did find this video on how to plot stitches for an image). Here is some info about Machines and on top of the machine it looks like you would have to buy the software to digitize the images. From what I am reading about machine embroidery it would require a fairly expensive machine plus the software to do more complex images and a lot of time on the computer working it out. I already spend too much time on the computer eek! 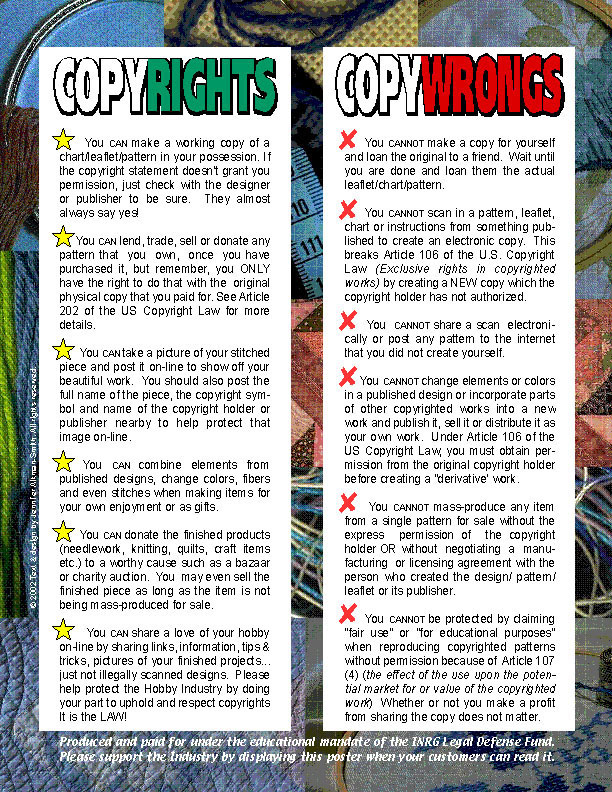 By the way the embroidery world is not without it's own drama and conflicts with copyright. As the baby lay in the Sanatorium nursery her mother's lungs healed from tb. The sun shone but it didn't smile on the baby for there was a darkness lurking and it was evil. Even though I am randomly adding bits and pieces it still doesn't have the freedom I want. Perhaps I just have to let it be what it is. 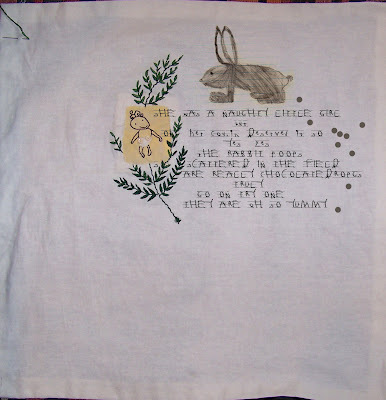 I am treating this is a sampler where I can explore stitches and ideas. The sun is satin stitch. and I am thinking my little birdy may end up on the embroidery piece somewhere. 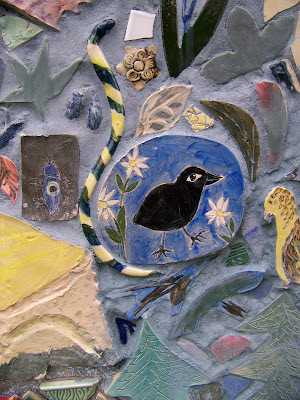 I did this small tile for the John Bryan Community Mural Project a couple of years ago. I loved the reflection on the pizza window, almost looks like a painting and the shadows of the trees on the graffiti. I see this every week when I walk the bike trail with my walking buddies and enjoy it every time. Meanwhile NO MORE graffiti on this wall on the other side of the trail. BUT I enjoy the remnants and the no painting sign. By the way that cute little baby is me :) wasn't I adorable, uh huh! I can see this process (even in just playing) is going to be very slow compared to painting and assemblage. I do a little bit, then figure out what to add next. I don't think it will have the looseness like Tilleke's work, but it is a whole new approach for me. Apart from enjoying the challenge, I am enjoying the meditative quality of doing embroidery by hand. I went through my old embroidery box and wow,! I don't even want to tell you how many unfinished crossstitch and embroidery samplers I had in there from 25 years ago. This one did get finished and was a reproduction antique dutch sampler kit I got in Snider Plaza, Dallas. When the kids were little I just couldn't do my embroidery or quilting anymore, so I put it all aside until they got older. Well here I am 25 years later LOL! Here is a HUGE selection of Samplers from a company that supplies authentic reproduction kits at Antique Essamplaire. Did you know the Swiss Post issued the first embroidered stamp in the world. Very often a victim is silenced and he/she hovers in the background blending in but if you open your eyes you can see. "Darkness to Light, confronting child sexual abuse with courage"
It will turn your world upside down, alienate family who don't want to accept their brother, uncle, father, husband, grandfather, could possibly abuse YOUR child. It will change your life. It will shatter your marriage, and your children's lives, but in the end, you will have done something all abuse victims pray for.